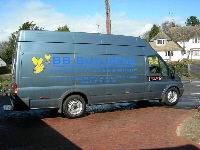 BB Builders was established in 1997 by its owner, Brian Bishop. Brian is a time served apprentice and has twenty five years experience in the building industry. He is a Member of the Federation of Master Builders and is expert in most elements of smaller scale building works. Brian’s knowledge of building regulations and legislation is comprehensive and up to date. He is enthusiastic about his subject and will take time to give you as much information as you wish regarding the technical aspects of your project. Brian lives in Barton Le Clay with his wife Kim and two children. BB Builders has completed works ranging from �500 to �200,000. Customer satisfaction is of paramount importance to us and we can prove it! Please see our Customers Say page. We enjoy our work and take pride in the standards we achieve. Please see our page on Quality. If you are out walking at Barton Springs and you see us with our German Shepherd, Tyler, come and say hello!